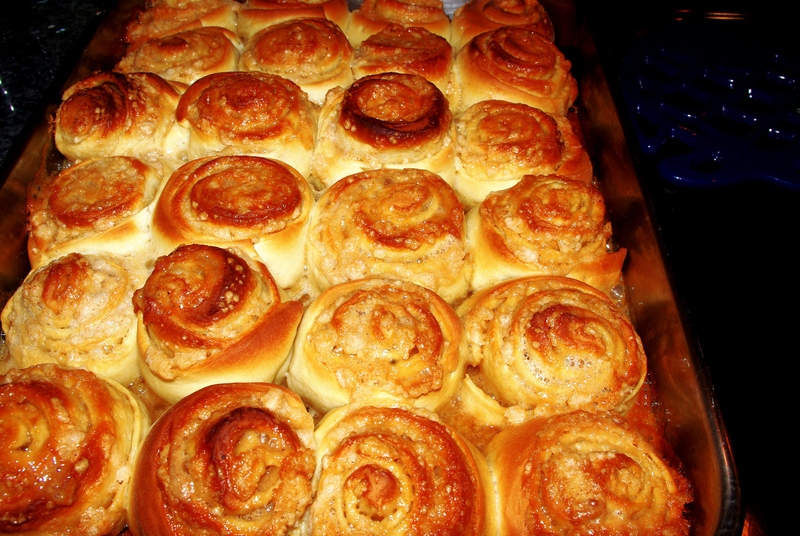 My family makes cinnamon rolls like others make sandwiches. A couple dozen are the go-to breakfast treat for family gatherings, a standard request at church bake sales and a traditional offering for friends with a new baby or home. We use no set recipe. I prefer a milk- or sour cream-based dough, which comes out buttery smooth. My sister, when she is in mass-production mode (10-12 dozen), uses a basic recipe with water as the primary liquid, which produces a very light roll. Nor are we committed to the idea of cinnamon as the filling. The hands-down best variation is the roll that takes humble peanut butter and elevates it to creamy baked sophistication–satisfying to kids but more grown-up than the main ingredient implies. The mechanics are the same, but instead of covering the dough in melted butter, cinnamon and sugar, the dough is rolled with a crumb-like filling of peanut butter, butter and powdered suger (see recipe). The leftover peanut butter crumbles are then whipped with milk to make a sublime frosting. The combination is not too sweet and all nostalgia–a real crowd pleaser once your guests get over their initial skepticism. Previous Post How Much You Got? Oh peanut butter. Why didn’t I think of that. So delicious! My husband will be baking these delights very soon.